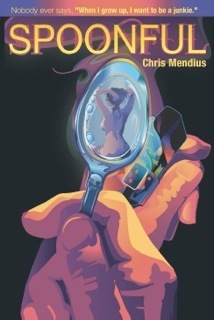 The characters in Chris Mendius’s novel, “Spoonful,” are expertly drawn: they are three-dimensional flesh-and-blood portraits of people. That is what is so special about this novel, its humanization of the story’s central players, which, admittedly, is a feat that’s not normally highlighted. This seems a prerequisite to any bound book containing words, but it is unique when the characters are people that society often shuns: heroin addicts. Mendius walks a tightrope between romanticizing his characters (and their drug use) and indicting them (and their drug use). It is easy to do either, but he skillfully does neither. He never once judges his characters, which is tastefully ironic given that these “types” of characters are exactly the types of people so often judged, and consequently demonized, by society at large. Michael, Sal, Lila and Dante, the book’s fascinating main characters, are as detailed as the book’s peripheral characters, like Teresa the den mother of a drug-dealing family in the hood, Stella the crusty pawnshop owner, and Kenny the resident crack-head. These are real people. Again, it is very easy to veer down a side road of stereotypes, but Mendius keeps his hands firmly on the wheel. His characters are almost too real; at times you feel like these folks could be your neighbors (who knows, maybe they are?). For instance, Theresa’s son, Mookie, an aspiring high school football star, does his homework amidst the drug deals and loitering junkies (some of those junkies being extended family members). The story takes place in Chicago in the 90’s – a time period I am wholly familiar with – and it captures that Generation-X feeling of apathy and directionless futures with pinpoint accuracy. The book’s style is gritty realism. And I like that, I like that a lot. That doesn’t mean it is without humor or a sense of whimsy. On the contrary, it is very funny and loose. The drug use is also handled with class – some reviews have described the novel’s depiction of drug use as graphic, but I felt the opposite. It is described just enough, but not overly so. The drug use fades into the background as the characters – their personalities, their pathos, their behavior and interactions with others – take precedent. The addiction is quite simply part of the characters’ lives. It is that matter-of-fact, and I find Mendius’s handling of that part of their lives refreshing. “Spoonful” succeeds as a novel. The story is unpredictable (it keeps you glued to the pages), but the outcome is also inevitable, and that’s extremely human. While you may or may not be a drug addict, or have dealt with addiction in the past, I believe that anyone can be the character Michael Lira. That’s how it feels: Mendius puts the reader right into his shoes and it’s the real deal.